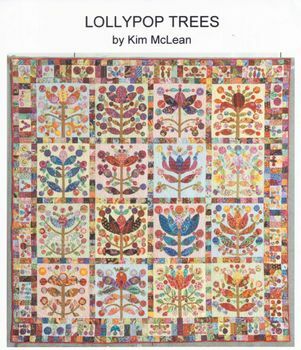 Lollypop trees pattern is my favourite of Kim McLeans quilts- 94" x 94" and full size patterns in satchel. Kim likes to use Kaffe Fassett in her applique and kaffes fabrics really do suit these funky and cute trees. Would look equally as stunning in Batik Bali's on black! Can be raw edge applique or needleturn or blanket-stitched, plenty of great instructions and lots of little tips from Kim. Wish i had more time!!! !